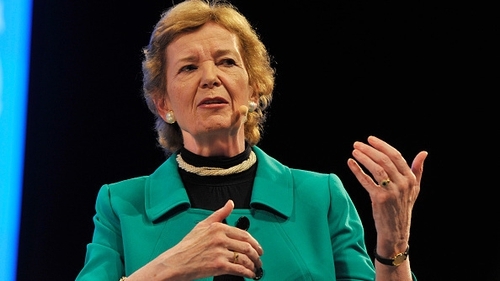 Former president Mary Robinson has said "mischief-makers" may be lying in wait to cause trouble if a hard border is imposed on the island of Ireland. The comments come after Taoiseach Leo Varadkar warned of a risk of a return to violence, should customs posts be erected between Northern Ireland and the Republic. Mr Varadkar has been accused of scaremongering after warning during this week's EU summit that a return to violence is a possibility in such a scenario post-Brexit. Speaking to the Press Association at the One Young World summit in The Hague, Mrs Robinson, said a hard border could provide a "visible opportunity" to those who wish to disrupt the peace process. The former UN High Commissioner for Human Rights said: "I think there is a real risk, if we had a hard border in Ireland, that there are people, as we would say, lying in the long grass, on both sides waiting to do mischief and unfortunately it could lead to that. "We have had a peace process and a peace outcome that the world has admired. It's really important that, on the island of Ireland, we live in peace and friendship and harmony, and that is what we have been doing. "And I think it's really important that we don't have a border that provides a visible opportunity for those who could be not only disruptive but actually go back to violence." She added: "Most of the people that I have spoken to in Northern Ireland believe this." Addressing EU leaders in Brussels on Wednesday, Mr Varadkar related the story of an IRA bomb attack at a customs post in Newry, Co Down, in 1972, in which four customs officials, two lorry drivers and three IRA men died. DUP Brexit spokesman Sammy Wilson branded Mr Varadkar "vile" and accused him of using victims of terrorism in order to scaremonger. But Mr Varadkar was defended by Tánaiste Simon Coveney, who said concerns about the potential to destabilise the island's "very precious peace" were real. Separately, Ulster Unionist Party leader Robin Swann has said the backstop would make Northern Ireland a protectorate of an unaccountable EU. Mr Swann told his party's annual conference in Armagh: "This is not just about the immediate constitutional problems it raises, but also the long-term implications as the UK would begin to diverge from EU regulations. "It would effectively make Northern Ireland an EU protectorate. "If this scenario were to become a reality, we would be complying with regulations set by a body we were no longer part of and we had no input into. "So where is the accountability?" The Irish Government has said it is not challenging the constitutional position of Northern Ireland as part of the UK but wants to preserve frictionless cross-border trade and peace on the island. Mr Swann said: "Let me also be clear that we want a good relationship with our neighbours in the Republic of Ireland, but it's very hard to maintain that when you continually poke us in the eye. Work with us, not against us. "So I have a message for Leo Varadkar, Simon Coveney and their colleagues in the Irish Government. Tread carefully. "Every day that you trample over the Belfast Agreement and the principle of consent, you do further damage to relationships across these islands. "Breaking the Belfast Agreement to facilitate the backstop risks destroying what has taken decades to build. "Stop trying to exploit Brexit to weaken the integrity of the United Kingdom. "It would also be economic vandalism to impose a border on our most important trading route which is between Northern Ireland and Great Britain."